In fitting shoes proceed as follows: First put two shoes in the fire at the same time. When red hot fasten the toe-calk; but before you do this, bend the calk a little to conform with the curve in the shoe. If it is a shoe wide on the toe bend the heels together a little, as the shoe is apt to spread and be still wider when finished. This precaution will prevent spreading, and leave the shoe the shape it had before being welded. When the calk has been fastened, put the shoe in the fire with the calk side up, and when red hot put a pinch of boraxette on the calk. Do not take the shoe out of the fire to dip it in the compound, for if you do you will lose time and sometimes even the calk, which is liable to all off, and then again if you move the shoe you must prepare a new place for the shoe in the fire, which is not as hot as the place it had before being moved. This is a mistaken idea, and it is to be regretted that the practice of removing the shoe from the fire to dip it in the compound prevails to a great extent among shoers. Have a little spoon provided with a handle eighteen inches long, and with this spoon put the boraxette on. It always pains me to see horseshoers pull the shoe out of the fire where it is in a hot place, ready to weld, and plunge it into a box of ice cold sand, scooping up as much as there is room for between the calk and the web of the shoe. The sand will stick and make a rough looking job, and much time is lost. If sand is used, put it on with the spoon, for it takes only a few grains to make the fluid. When welding hot, hammer the calk down good into the shoe, striking in such a direction that the toe calk will stand at a right angle with the shoe on the outside. This will permit the calk to lean out on the inner side, which it should do in order to let the snowballs out. In old shoes be sure to weld on the toe calks first, because it often happens that an old shoe will break at one end of the calk. Now then, if you have prepared the hind calks first, this work is done for nothing. In a new shoe it does not make any difference. When the toe-calk is finished punch the holes. If it is a large shoe, punch only the two front holes in the toe-calk heat, and the two hind holes in the heel-calk heat. The holes should be punched from the upper side first, and then from the creased or bottom side. 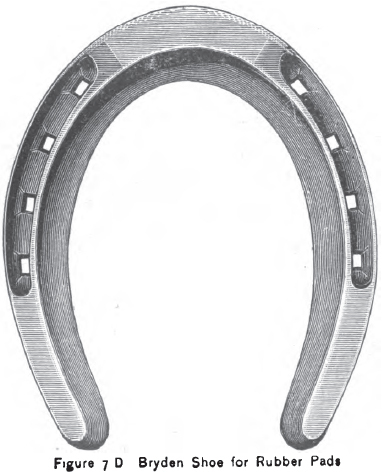 In many parts of the country steel plugged shoes are used especially for winter shoeing. First prepare the plug. The best material to use for plugs is an old mower section. Put the section in the vise and break it into small squares from three-eighths of an inch to an inch square. 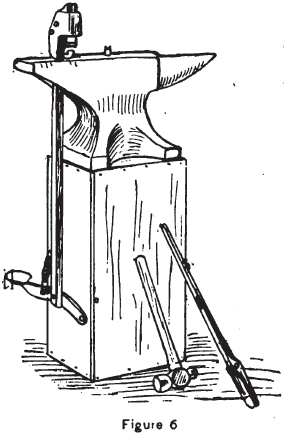 When the calk is ready to split, place the shoe in the plugging machine shown in Fig. 6. This is a new invention, patented by the inventor, Patrik Holmstrom, Hancock, Minn. These calks will keep sharp if they are hardened at a high heat. Fig. 7 represents dies for welding both heel and toe calks. Fig. 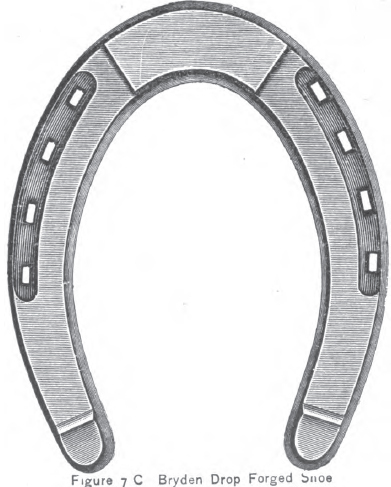 8 illustrates a shoe that has been invented and patented by Otto A. Meyer Co., of Milwaukee, Wis. This shoe is quite a novelty and has many commendable features. 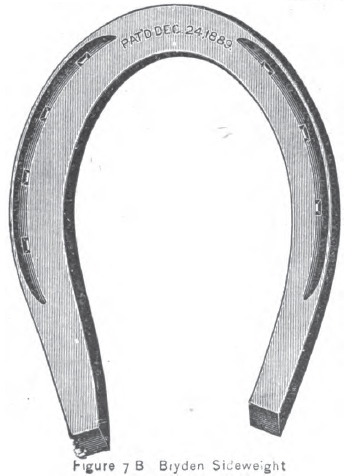 In the first place we notice that the calks are set in the center of the web, which is a commendable feature for horses inclined to interfere, or cut themselves, or other horses working along side of them. 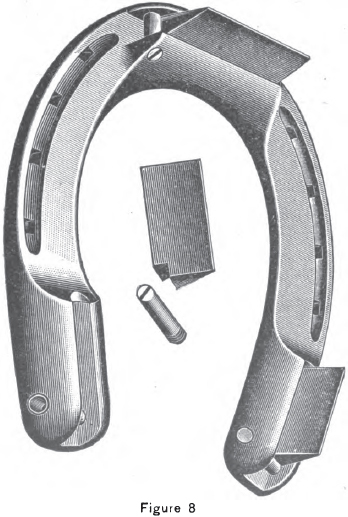 In the fore calks this feature will prevent the hind shoe from pulling off the front shoe, which is very troublesome to the driver and sometimes dangerous to the horses bent on over-reaching. Another feature is the quick way in which the calks can be removed and replaced. Not long ago a veterinarian brought his horse to my shop, and wanted to know how I could shoe him. Said he, “The horse is not lame, but I notice he is sore in both fore feet, and they have begun to contract; but I am on the road a good deal of the time and the horse must be shod.” This horse was shod with wide heavy plates. I had the plates pulled off, and told him to lead the horse into the river and keep him there as much of the time as he could until the next day, when he was to bring the horse back to be shod. The veterinarian, living close to the river, did as I told and, and brought the horse back the next day to be shod. “Well,” he said, “here is that soaked horse now, but how are you going to shoe him?” I told him I intended to put on shoes with short but sharp calks. He then wanted to know the use of calks on his horse’s shoes. 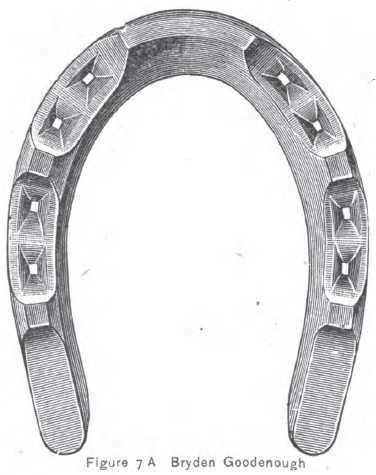 I told him that flat bar iron, like the slabs put under his horse, would jar the teeth out of the mouth and produce inflammation in the sensitive laminae, and swell the tendons in the feet of any horse, and especially a horse like his with much knee action. To this explanation the gentleman finally gave in. I shod his horse as I said, and when done reminded him of the river close to his place-that he should be sure to have the horse spend some of his spare time with his feet in the river. A few weeks later I met this veterinarian and he told me the pointers I gave him were worth money. Plates should not be used on any horse, because they are hard to stand on, being more slippery than the bare foot, and they jar the foot. Plates, when used (except as a protection to a foot cut open or otherwise in need of protection), should not be over one-half inch wide. Of course there are objections also to calks, raising the feet from the ground, which will cause them to dry up and contract, but this is easily overcome by the use of hoof ointments, or by packing the feet once in a while. 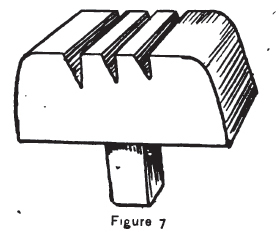 The shoe in Fig.7A is the shoe that should be used everywhere a plate is wanted, as it has a small striking surface, will not slip and takes up jars. Bryden C., as shown in Fig. 7C, is also a commendable shoe.